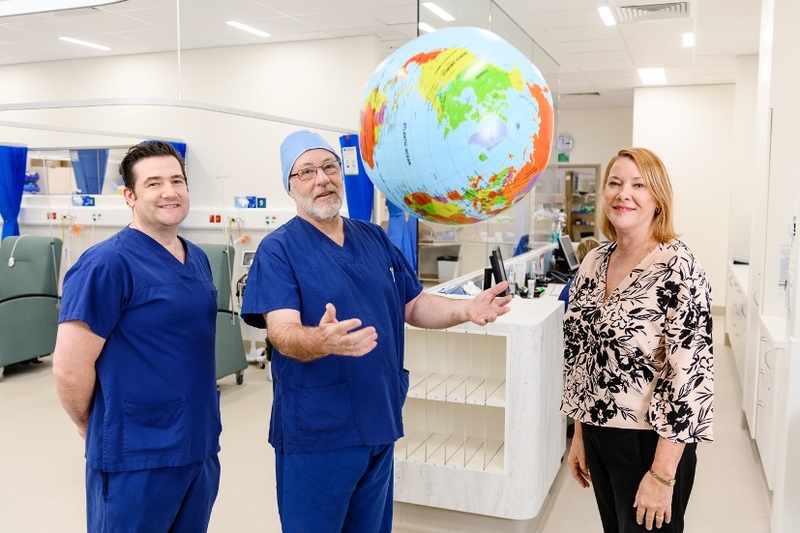 Ross McIlwraith, one of the Burnside Hospital Clinical Nurse Coordinators in the Perioperative Suite, leaves in September 2018 to volunteer on the ‘Africa Mercy’ hospital ship, delivering onboard surgical services to the people of Guinea, West Africa with the Mercy Ships organisation. The ‘Africa Mercy’ trip marks the beginning of a career transition for Ross, as he works towards a retirement of sorts from professional nursing and onwards to increasing volunteer stints as he gradually winds down from his 40 years of nursing, 20 of these with Burnside Hospital. Ross will be a scrub or instrument nurse (i.e. participating in the surgical treatment of patients) on board for three months, in which time the surgical team will complete about 2,000 procedures. The ship itself is a 152m Danish ex-rail ferry and has been serving as the world’s largest non-military hospital ship since deployment in 2007. It hosts five operating theatres and houses an 80 bed ward which Ross quips, ‘makes it comparable to a Burnside Hospital sized facility on water’! Conditions treated onboard can vary, with the most prominent procedures being eye surgery (cataracts) in both children and adults and reconstructive surgery for burns, which is also common due to lifestyle factors in Guinea communities. Some of the more troubling cases involve obstetric fistula’s which have resulted in social ostracism for women, maxillofacial tumours, club feet and bow legs, particularly in children. While Ross feels prepared for the reality of this from his time in the Solomon Islands, he also understands the cultural and psychological distress that some of the ship’s new volunteers experience when confronted with such suffering and adversity. These are people who sometimes walk for days to receive treatment that they have waited a lifetime to receive. Debilitating, often painful conditions have been endured by both children and adults, most of which could not afford a Panadol, let alone surgery. I am honoured to be able to support such a deserving and grateful community of people. In addition to clinical care, the ship also provides education and training for local medical teams and an agricultural program that supports local famers to yield more form sustainable farming practices.